See how volatility in Q4 2018 compares with the averages since 1992 in this #chartonthego. Volatility spiked at the end of the year. 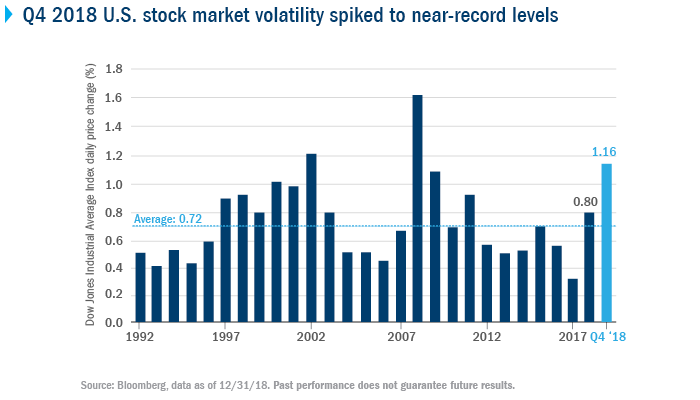 Volatility was relatively normal in 2018 until the fourth quarter. A confluence of concerns, including the government shutdown, fears of sharply higher interest rates and the ongoing trade conflict weighed on the U.S. stock market. The average daily price change was 0.80% for the entire year. Since 1992, on an average out of 252 trading days in a year, there have been 16 days with a daily price change greater than 2%, five days greater than 3%, two days greater than 4% and one day greater than 5%. In Q4 2018 alone, there were 14 days with greater than 2%, three days greater than 3% and one day at 5%. The Dow Jones Industrial Average (DJIA) Index represents a price-weighted index composed of 30 blue-chip U.S. companies selected and maintained by editors of the Wall Street Journal. An investment cannot be made directly in an index. The views expressed are as of the date given, may change as market or other conditions change and may differ from views expressed by other Columbia Management Investment Advisers, LLC (CMIA) associates or affiliates. This information is not intended to provide investment advice and does not take into consideration individual investor circumstances. Since economic and market conditions change frequently, there can be no assurance that the trends described here will continue or that any forecasts are accurate. Investing involves risk including the risk of loss of principal.